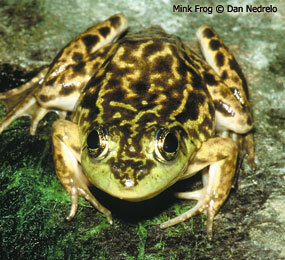 Targeted surveys for mink frogs will be added to the Wisconsin Frog and Toad Survey this year! These surveys will focus on mink frogs for the next few years, but some may be turned into standard routes in the future (or they could continue to be run as phenology surveys). One of our primary objectives for these surveys, is to provide additional distribution information for this Species of Special Concern. A second objective is to gain additional information on the calling activity of the mink frog – this species is known to call in the afternoon as well as at night, and may not be adequately covered by a standard evening calling survey. We are looking for volunteers to complete at least two afternoon and two evening surveys of designated routes in 21 counties within the frogs' known range. Sign up for a route! Volunteers will be assigned on a first-come, first-served basis, although we will be accepting up to two separate volunteers per route to increase the number of surveys that are conducted.